As one of the most internationally renowned Chinese pianist and conductor in the world, XU Zhong is currently Music Director and Chief Conductor of Israel Haifa Symphony Orchestra, Principal Director of Fondazione Arena di Verona, General Director of Shanghai Opera House, Chief Conductor of Suzhou Symphony Orchestra and Dean of Suzhou University School of Music. Between 2012 and 2015, he was Artistic Director and Chief Conductor of Teatro Massimo Bellini, being the first Asian artist to take up this place. He graduated from Conservatoire National Supérieur de Musique de Paris, under the direction of the famous French pianist Dominique Merlet. As a conductor, he learned with Prof. Xiaotong Huang and Maestro Piero Rattalino. 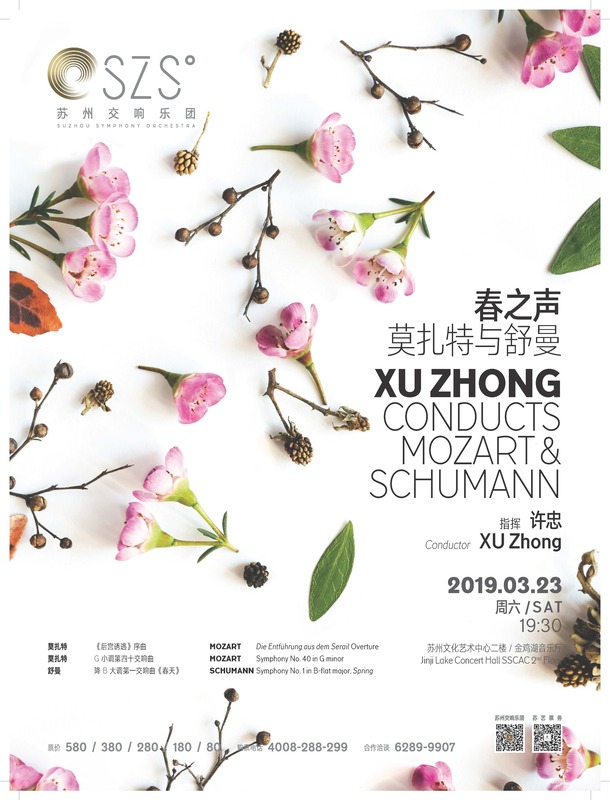 Over the years XU Zhong has been actively worked with many prestigious orchestras, including Orchestre National de France, Orchestre National de Lille, Moscow State Symphony Orchestra, MDR Symphony Orchestra, Orchestra Sinfonica di Roma, KBS Symphony Orchestra, China Philharmonic Orchestra, Shanghai Symphony Orchestra, etc. His talent in conducting, in particular, has been acknowledged in the leading opera houses in Europe and worldwide - Teatro alla Scala, Teatro La Fenice, Teatro Regio Tornio, Teatro del Maggio Musicale Fiorentino, Teatro di San Carlo, Arena di Verona, Liceu Grand Theatre, Palau de les Arts Reina Sofía, Opéra de Paris, Royal Opera House, Erfurt Theatre, Staatstheater Darmstadt, Metropolitan Opera House, San Francisco Opera House, among many others. His repertoire includes I PAGLIACCI, CAVALLERIA RUSTICANA, LA TRAVIATA, IL TROVATORE, LA BOHèME, TOSCA, SUOR ANGELICA, LA CENERENTOLA, LE NOZZE DI FIGARO, DER FLIEGENDE HOLL?NDER, DIE FLEDERMAUS, DAS LAND DES L?CHELNS, ELEKTRA, CARMEN, LA VOIX HUMAINE, ORPHéE AUS ENFERS, ALEKO, among others. In 2010, XU Zhong was awarded the Chevalier de L'ordre des Arts et des Lettres by the Ministry of Culture and Communication, France, for his contributions in classic music and cultural exchange. In 2018, XU Zhongwaspromotedasthe Officier de l’Ordre des Arts et des Lettres.